West Indies is due to face India at Kochi today in the first of five ODIs but the WI players have reportedly refused to play under a Memorandum of Understanding (MOU) signed last month between the West Indies Cricket Board (WICB) and WIPA. According to the West Indies Cricket Board (WICB) release, “It has come to their attention that the some of the players could withdraw their services for the first ODI. The WICB deeply regrets this apparent eventuality, especially in light of the tedious and substantial work which went into the good faith negotiations to arrive at the new, historic CBA/MOU. The WICB apologises to the fans, the BCCI and all other stakeholders should the first ODI be disrupted as a result of player action. The WICB is making every effort to ensure that it fulfills all its commitments and that cricket is played. 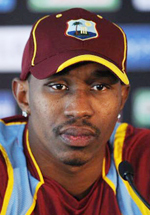 This response came shortly after Dwayne Bravo, Captain of the West Indies ODI team in India, reportedly acting on behalf of his entire team, dispatched a letter to Hinds. The following are excerpts from the letter sent from the West Indies Captain to the WIPA President yesterday. “We refer to our last correspondence to you dated October 6th, where we the players suggested as a way forward that: “The players are proposing in light of the above and our previous correspondence, that we continue with the same old payment structure which was previously agreed by WIPA and WICB until we are in a position to properly be informed of all the WICB’s finances etc, have an input in the decision making process and more importantly negotiate an acceptable agreement in an attempt to arrive at a win-win resolution. We are of the view that this proposal would be an acceptable way forward since everything remains the same and more importantly neither the WICB nor the players are in a disadvantageous position while we continue to discuss further. We are disappointed with the lack of proper representation and the players are now forced to make this proposal without any details as to how this new purported agreement was even arrived at and by whom, since the only advice we have received from you as President and CEO of WIPA is to not sign the contract/agreement that was sent by the WICB. The players are of the view that as a matter of principle, we should not accept these conditions whereby we are being asked to play a series against India without any certainty of what are our obligations and what we will be playing for. As you would appreciate Mr. Hinds, this is how we as professional cricketers earn our livelihood and provide for our families, our careers are short and uncertain, furthermore it is a highly competitive and stressful environment as one bad performance can see you out of the team forever, a player can suffer an injury at any time which could not only be career threatening but in many cases affect their lives even after their playing days are over. As we have indicated to you earlier, the players here in India are under tremendous stress and the team morale is at an all-time low. We believe that this present WIPA Executive under your leadership has failed to properly represent the best interest of ALL the players. Many are questioning whether there is now some “special relationship” between the WICB and WIPA which may be good for some but has not taken into account the whole picture resulting in what may be seen as embarrassing and demonizing some players who represent the WI, yet signalling to public that this new purported agreement (MOU) is in the best interest of West Indies Cricket. This is evidenced by the inaccurate WIPA press statement which was sent after we raised our strong objections to you both verbally and in writing. 1) There were little or no legal advice sought in the negotiating of this purported new MOU between the WICB and WIPA. 2) There were little or no Industrial Relations advice sought during the negotiations of the purported new MOU. 3) None of the players were consulted during and after the negotiations of this purported new MOU. This is a process that has been the common practice between previous WIPA representatives and the players. This was completely ignored. 4) The Players were never given the opportunity to consider the document (MOU) and approve it before it was signed consistent with past practice. 5) The first time any agreement was seen by the players was a match/tour contract with a new fee structure significantly different from what we received in the past. This was given to us in India. 6) To date, the players have still not seen this new purported MOU between the WICB and WIPA. 7) The players’ rights which we have protected through many negotiations and Arbitrations have been given away for nothing. 8) Questions raised by some WIPA Board members were ignored. 9) The WIPA Board never approved the new purported MOU before it was signed. 10) WIPA is receiving in addition to the 3% of all players earnings, a sum of $500,000USD annually from WICB (1% 0f WICB Revenue) once this new agreement remains. we as players who are paying members of WIPA demand that proper representation is required. We wish to make it very clear that should the players be forced to take matters into their own hands, we will not hesitate to take the appropriate action as see fit. We will hold you and the WIPA Board who support this process liable. 1) Have the WICB Board members and staff taken a pay cut as we are being asked to do or at all. Our information is that staff has been increased both in numbers and their salaries. 3) Have the WICB declared how much they are being paid extra for the matches outside of the FTP like this India tour. 4) Have the WICB declared what they are getting from the sale of CPL to Digicel our most lucrative tournament. 5) Have the WICB declared what they are getting from Digicel as the team sponsor. 6) Have they declared their financial arrangements with Governments for the international and regional home series. We wish at this stage to once again reiterate our position as a way forward, let us continue under the old structure until we are able to properly negotiate a fair and reasonable agreement in the best interest of West Indies cricket. This in our view is a sensible approach since it would give us players an opportunity to have an input, seek the necessary advice and put our house in order. We have articulated this position to Mr. Richardson, Mr. Pybus and Mr. Lloyd who all understand our position. It is without question that we want to see West Indies cricket rise again and we are very committed to that process, but the way it is being done is most unfortunate and unacceptable. We believe we are being hoodwinked and are being treated like little school boys, yet we are being asked to perform and play as professionals. We appeal for good sense to prevail and that you, who have a responsibility until such time that you hold the position as President and CEO to act in all the players’ best interest” Bravo’s letter concluded.